Kirk Braddan is dedicated to St Brendan. Designed by John Loughborough Pearson (1817-1897) in the Early English style, it is a large, pleasant building, built in local pale-red clay brick, with windows, pillars etc. in York stone, and faced outside in local stone. 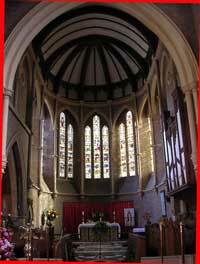 The building is of a simple form, with a nave and north and south aisles, a north transept (fitted out as a war memorial chapel in 1952) and an apsidal chancel with a high arch and no rood screen. The vestry is an undercroft beneath the chancel (the site sloping steeply from west to east). 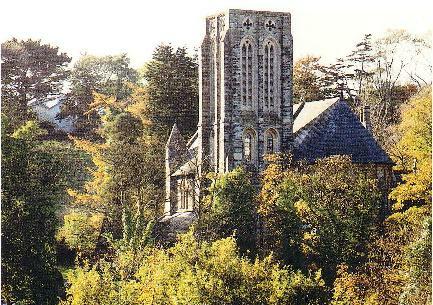 The church was built by public subscription at a cost of £6,775.19s.7d, and was consecrated as the parish church, by authority of the Braddan Church Act 1872 (of Tynwald), on the 31st August 1876. The chancel floor is of marble and was designed by Baillie Scott. For further details click here. 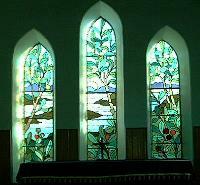 The church contains some fine 19th and early-20th century stained glass, including 5 of the 7 windows of the chancel apse. Burials in the church and church grounds are prohibited by law. The war memorial in the grounds, to the south-east of the church, was originally erected in 1921 at the junction of Saddle Road and Peel Road, and was moved to its present position in 1967. The tower, on the south side of the chancel opposite the transept, originally had a wooden spire (right), which was blown down in a gale in 1884, re-erected, and again blown down in 1886. 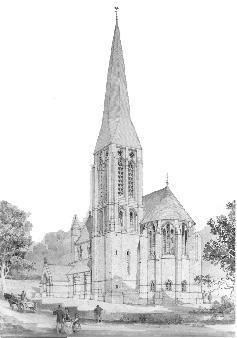 J L Pearson in 1888 designed a steep gable roof to replace the spire (a copy of his drawing is on the wall of the north aisle), but it was never constructed. The organ is housed at the foot of the tower, which has a bell-chamber but no bells. 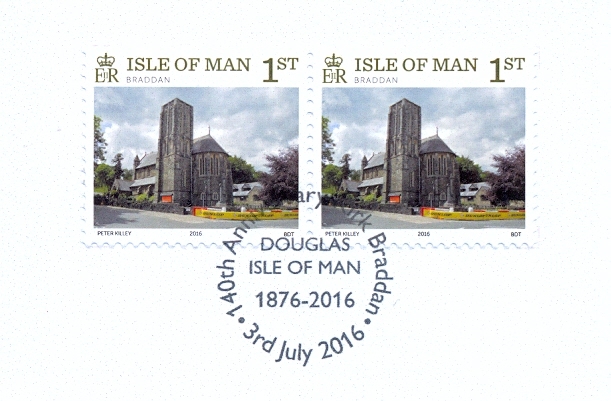 The church is featured in a stamp issued by the Isle of Man Post Office in June 2016 as part of a collection celebrating the annual Parish Walk. A church hall complex is on the north side of the church. The original hall, facing Peel Road, was designed by Frank Loughborough Pearson, son of J L Pearson, and was built in local stone in 1911-12. (Click here for the history of its construction.) The original dressed-stone window mullions decayed and were removed, except on the wall facing Peel Road. A new hall has now been built as an extension to the original hall. 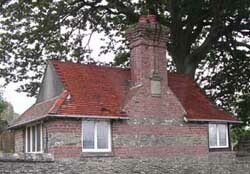 Phase 1 of the project, comprising a new toilet block and a wide corridor linking the existing hall to the church, was dedicated by the then Bishop of Sodor and Man, the Rt Rev Graham Knowles, on 22nd February 2004. Phase 2, comprising a new hall (which may be partitioned into two rooms), two store-rooms and a kitchenette, was dedicated by the then Bishop, the Rt Rev Robert Paterson, on 21st November 2010. The new church replaced the former parish church on a nearby site which has been used for religious purposes since the earliest times. Rebuilt in 1777, Old Kirk Braddan was never reordered in Victorian times, and contains its original box pews, gallery and a "three-decker" pulpit, with a lectern, minister's pew and pulpit above. 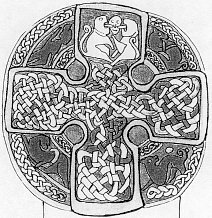 It now houses several Celtic and Norse crosses from the period 800-1265, which were found in the parish. The church is still used occasionally for worship. 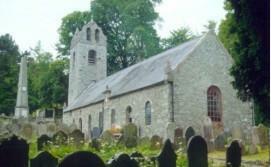 It is entered in the Protected Buildings Register, and maintained by the Friends of Old Kirk Braddan. It was featured in a 35p Christmas stamp issued by the Isle of Man Post Office in 2010. Click here for photographs of features of Old Kirk Braddan. Click here for a Short History and Tour by Peter Kelly. 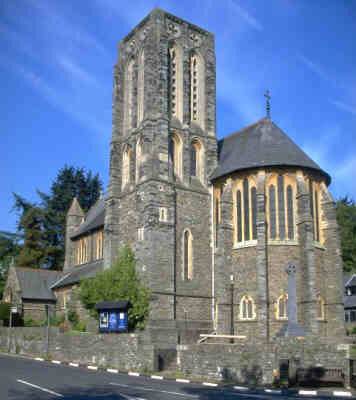 The church has two bells, in a bellcote on a small tower at the west end. The tenor (G) is inscribed "1780", and the treble (E flat) dates from about 1800. They are commemorated in a 19th-century drawing-room ballad The Bells of Old Kirk Braddan by James Sutherland and M L Wood (Manx National Song Book vol.ii p.13). The church also has a hymn-tune named after it, KirkBraddan by E C Walker (1848-72); it is used as a setting of the Epiphany hymn From the eastern mountains by Godfrey Thring. For a score (PDF) click here; for an audio (MIDI) file click here. The old churchyard was full by 1848, and was formally closed for burials in 1921. One of the crosses preserved in Old Kirk Braddan, which featured on a 6p postage stamp issued by the Isle of Man Post Office in 1978. Click here for details of all the Celtic and Norse crosses in Old Kirk Braddan. The Braddan Burial Ground Act 1848 enabled the churchwardens to purchase new burial ground off Braddan Road, a few hundred yards from the church. 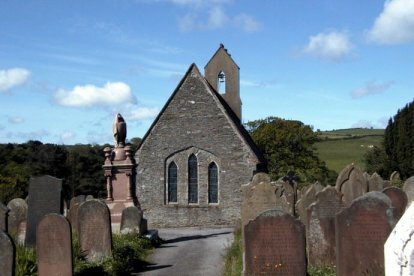 It was extended in 1898 and 1938, and is now the largest in the Isle of Man; it is still managed by the churchwardens under the Burials Act 1986. The "Arts and Crafts" designer Archibald Knox is buried there. A simple chapel stands in the middle of the burial ground; it has a bellcote with a single bell (by T Hodges, Dublin, 1858) at the west end, and an east window designed by Baillie Scott and representing the "Tree of Life". 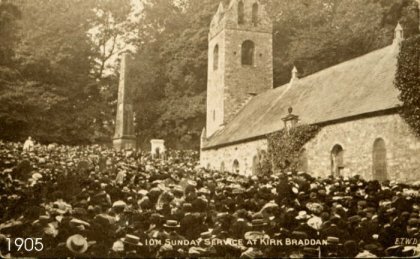 "Pallida mors aequo pulsat pede pauperum tabernas regumque turris"
When the Manx tourist industry began to grow in the 1850's, it became the custom for summer visitors to walk or drive from Douglas to Braddan for Divine Service on Sunday mornings. Their numbers so increased that the old church could not hold them, and in 1856 Sunday morning services began to be held in the churchyard outside. 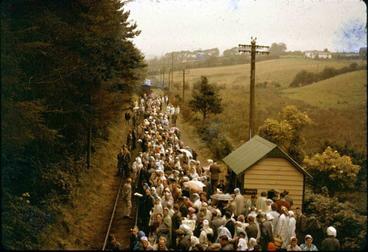 Congregations grew further, particularly after Braddan halt on the Douglas-St John's railway line was opened in 1897, and in 1913 the services were transferred to the field to the west of the new church; the field was purchased by the vicar and churchwardens in 1927. On Sunday 17th August 1958 the service was broadcast on the BBC Home Service, the first time a religious service had been broadcast from the Isle of Man. 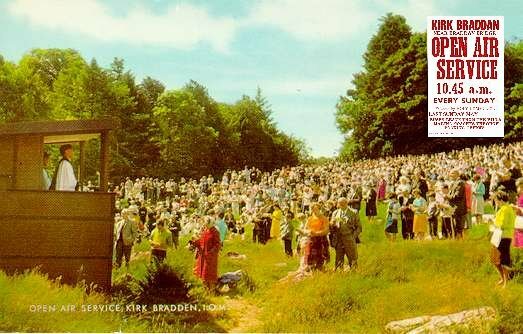 On Sunday 7th July 1963 the service was attended by HM Queen Elizabeth the Queen Mother, who visited the Island to preside over the Tynwald ceremony on 5th July. The numbers attending the services began to fall after the 1950's, with the decline in the tourist industry in the Isle of Man, and regular services were discontinued in 1986.